WhiteCloud Software Ltd. announced the release of version 4.2 of EAComposer. An innovative and simple-to-use enterprise architecture tool used it to manage your IT landscape and technology portfolio. Delivered as a pure SaaS product: cloud hosted with a subscription based license model. Release 4.2 has been focused on enabling industry best practices for both username/password management as well as user access privileges management. - Enabling Single Sign On (SSO) - You can leverage your corporate identity provider such as Microsoft Active Directory or Oracle Identity Manager to also manage username / passwords for EAComposer. We support any SAML2.0 compliance Identity Provider. - Enabling Directory Mappings - As an extension of the above SSO we also enable you to manage authorization using your own directory groups. 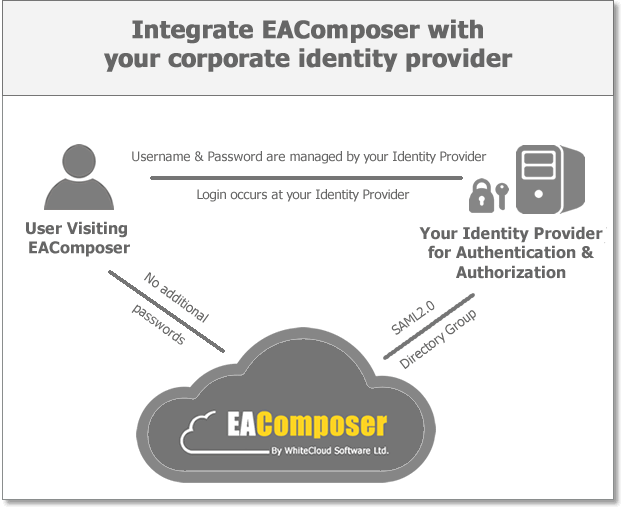 Create directory groups for your EAComposer users within your corporate Identity Provider and leverage these groups for managing access privileges within EAComposer. Also bundled with this release a series of minor enhancements such as ability to set the heatmap mode to either filling or just coloring the outline of the component shape and more flexibility to the user administration functionality.